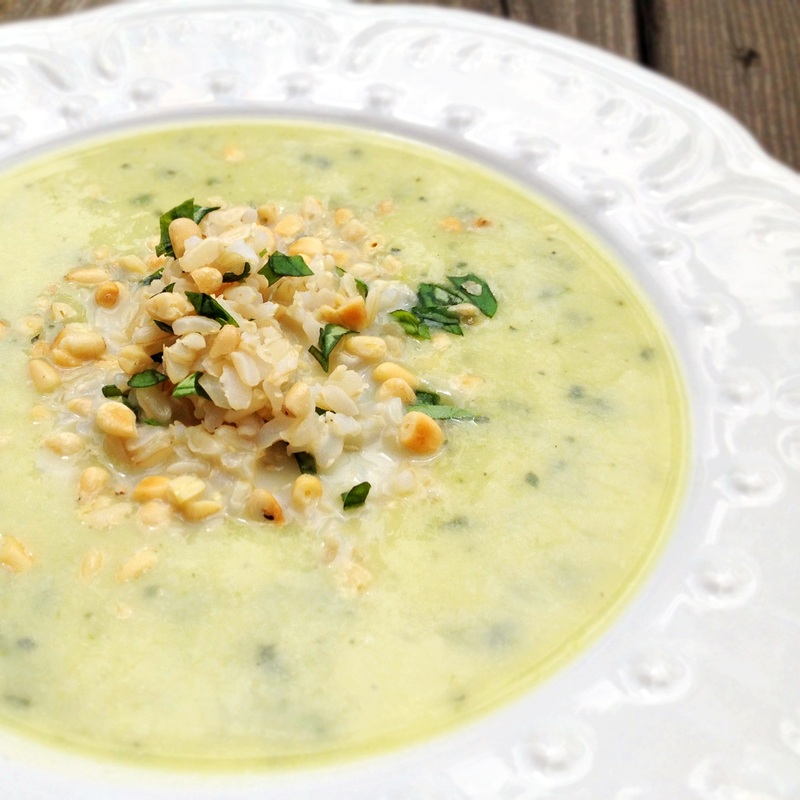 Combine the zucchini, onion, garlic and vegetable broth in a large saucepan. Bring the mixture to a boil over medium heat. Reduce the heat to medium-low, cover, and cook for 10 to 12 minutes, or until the vegetables are very tender. Puree the cooked vegetables and broth directly in the pan using an immersion blender, or allow the mixture to cool until safe to place into a large food processor or blender, puree, and return to pan. Add the coconut milk beverage, salt, and pepper to the pureed mixture. Cook uncovered over medium-low heat for 4 to 6 minutes, stirring regularly, to warm the soup and combine flavors. While the soup is warming, combine the rice and basil in a medium bowl. To serve, divide the soup between 4 to 6 shallow serving bowls. Decoratively mound an equal amount of the basil-rice mixture into the middle of each bowl. Garnish the top of the rice mixture in each bowl with an equal amount of the chopped pine nuts. Serve immediately.